Want to be a better Manager? Do you work for someone who you think needs to be a better manager? 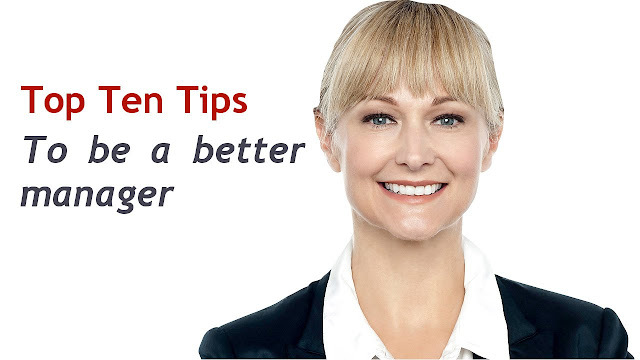 Here are my top ten tips for becoming a better manager. When you're a manager, your success rests or falls on the quality of your team. Getting the most out of your people is your day job. 1. Adopt a customer service mindset. This is a slightly different take on the internal customer principle, because typically that applies to other departments, colleagues in other teams, even external suppliers. Yet adopting a mindset of the customer can really impact the relationships you have with your team. In my experience managers are really good at making statements, they're really good at telling people what to do Back to that policeman mode). they are far less good at asking questions where they really want to understand the other person, or the team's perspective. they've even got more sophisticated at making their statements and instructions appear to be like questions. So, use simple open questions; classic questions like "what do you think?" You'll be amazed at the response you get. Particularly when you stop and actually listen to what people have to say. 4. Seek ideas and share your experience. All too often, managers feel that they have to be the person to come up with the solution; they have to solve all the problems. It's simply not the case. People are full of really good ideas, real creativity that can help you drive innovation. As a manager, your role is to facilitate getting those ideas to the surface. 5. Role model behaviour and values. It's not a case of do as I say, it's a case of do as I do. As mentioned earlier, making people clear on expectations is great, but you need to demonstrate those behaviours and values in practice. Don't tell people one thing and behave in another way. They will not follow what you say, they will definitely follow what you do. 6. Remember a team is made up of individuals. They have different skills, different abilities. They have different ways of communicating, different ways of learning. They have different hopes, different expectations. As a manager, our role is to meet people where they are in terms of communication, in terms of learning.Making time for people is a really important part of the management process. Work hard to really keep things simple. Aim to keep things as clear and simple as you can. Simple doesn't mean easy. simple doesn't mean patronizing. Simple means clear, easy to connect with and understand. It makes a tremendous difference. Clear communication, clear instruction, clear involvement. Keep things simple. 8. Give and seek high quality performance feedback. One of the things I hear most often in organizations is 'we don't get enough feedback'. Rarely is that the case. It's that the feedback that is around is of such low quality that people don't actually recognize it as feedback. So find ways to give clear, high quality, non-judgemental feedback and don't forget to ask for feedback on your skills and abilities as a manager. 9. Be positive. Be positive (most of the time). Remember you are not a policeman. You're there to motivate, encourage, support and engage. 10. Use these five simple questions. Here are five test questions. Ask yourself how your team, members would answer. Better still, directly ask members of your team to answer. If they answer positively, it's a strong indicator that things are going well and you are moving in the right direction as a manager.